Warner Bros.' Blade Runner 2049 finally arrives in theaters on October 6. After more than three decades, we finally get to see the long-awaited sequel to Blade Runner. 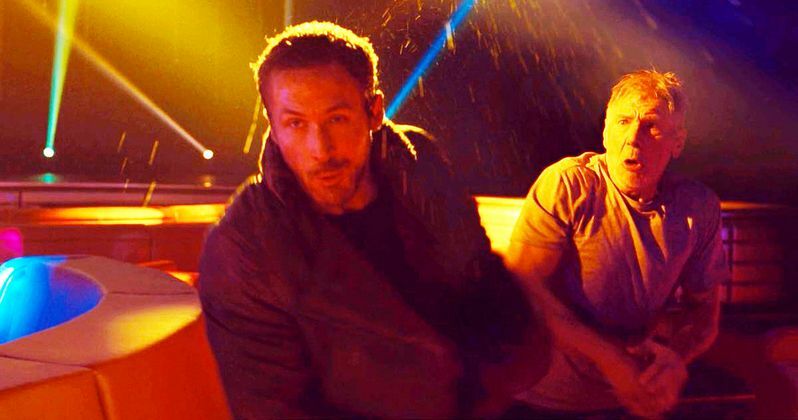 In the meantime, while we wait impatiently to see what is being called a modern sci-fi masterpiece, why not have a look at Harrison Ford actually punching Ryan Gosling in the face? That's right. The photographic proof to corroborate Gosling's story of getting decked by Ford while filming has arrived online, courtesy of Twitter user @GolazoDan. "This still of Harrison Ford accidentally punching Ryan Gosling for real during a Blade Runner 2049 scene is amazing." The story, which Ryan Gosling first told last December, has circulated a bit in the media since, but the evidence has yet to show up online. Until now, that is. This photo, which looks to be 100 percent legit, proves it and it is absolutely priceless. Even if a talented filmmaker tried to make this moment into a slapstick bit of comedy, it wouldn't be nearly as good. Gosling looks as though you can practically see the cartoon birds floating over his head as he falls back from the blow, and Harrison Ford looks more expressive than he's looked in decades. This has to be real. Just in case you forgot, here's how Ryan Gosling explained the incident. "We were just doing a fight scene and, you know, it just happened. But what was funny was, when it was over, they brought ice for my face, and Harrison pushed me out of the way and stuck his fist in the ice." Taking a bit away from this punch for a second, this is a good moment to remember just how important this movie is. Ridley Scott's original Blade Runner is considered a masterpiece these days, but it didn't start out that way. The movie bombed at the box office upon its release in 1982, but has since gone on to find a huge audience and a whole lot of praise. However, Ridley Scott is only producing this time around. Instead, it is director Denis Villeneuve (Arrival) who is taking the helm of Blade Runner 2049. He is directing from a screenplay by Hampton Fancher and Michael Green. Together, they are shouldering a lot of responsibility with this highly-anticipated, long overdue sequel. So far, the reviews have called the movie worthy of its predecessor. As for how we know the still is real? Ryan Gosling and Harrison Ford recently appeared on The Graham Norton Show and the photo was shown and discussed. Neither of them refuted the photo. Luckily, the clip made its way onto YouTube, courtesy of GMTV Gold. You can check out the photo of the actual Ford/Gosling punch from Blade Runner 2049 and clip from The Graham Norton show for yourself below.